Gokul Chat is the most popular snack joint in the city, that has been winning hearts for 50 years. No trip to Koti is complete without demolishing their Samosa Ragada. Boisterous, aromatic, frolicksome — this is how we’d describe our experience at Gokul. Forever bustling with foodies, it opens its shutters at 8.30 am and runs full-house till 11 pm. 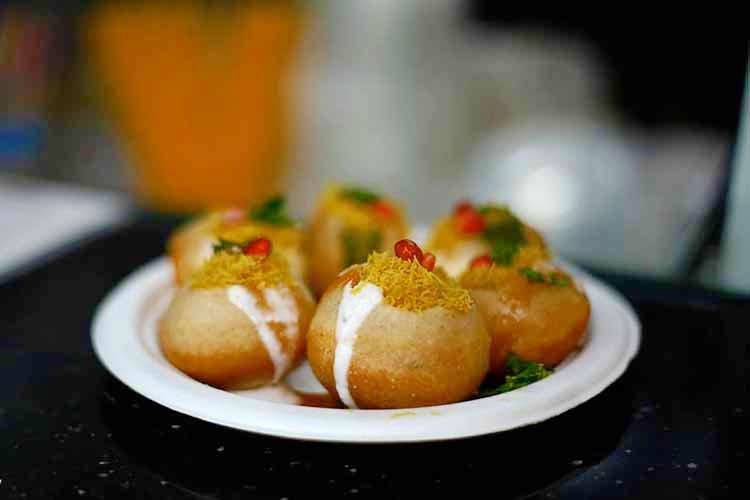 Craving Kulche Chole for breakfast or want to have a crazy start of your day with chaat? Gokul is your bae. Premchand Vijayavarg started this chaat bhandar in the 1970s, and it’s still run by him and his family. On approaching the store, you’ll find it rather amusing to see the crowds spilling out on the streets waiting for their turn to step in. But once you’re in, the chaat and the pav bhaji are swiftly ladled on plates and passed to you. With no seating area in sight, you got to rub shoulders with fellow foodies for a true gastronomical episode. On popular demand, we started off with Cut Mirchi Ragda (a generous helping of ragda is poured all over mirchi bajji) and Masala Puri and gasped for breath because of all things spice and flavourful. After quickly perusing the menu, we moved on to Cutlet Ragda, Papdi Ragda, and Cold Dahi Missal. While the Cutlet Ragda was extremely hot and saucy, the Cold Dahi Missal was a different ball game altogether. Let’s just say that it was a tangy mix of sweet and sour, and you should try it out. For us, these dishes were a clear winner over the Papdi Ragda, which gets a mere meh from us. We washed up the meal with kulfi and softy ice-creams (pick flavours of your choice: is it vanilla and chocolate or vanilla and mango?) and walked out in sweet glory. If you cannot handle the crowd, get to Gokul before 5pm. Beyond that hour, it's crowded (with no space for you to even stand) till the closing time.